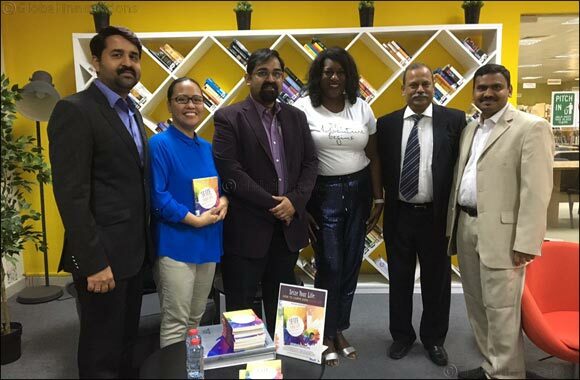 Dubai, UAE, November 9, 2017: In line with the university’s effort to engage students with experienced people from the industry, Skyline University College Library Department organized an “Author Meet and Greet” with Jasmine Brett Stringer on November 7, 2017 at SUC campus. Jasmine is a renowned American author, lifestyle expert, and motivational speaker. She is the author of “Seize Your Life: How to Carpe Diem Every Day”—a book full of lessons, helpful tips on life improvement, and stories that will certainly inspire readers to lead a better life. Jasmine conducted a motivational talk with the topic, “Seize your Life: Roadmap to Success” to the SUC community of students, faculty, and staff where she imparted her learnings and experiences, which later on led her to achieving her dreams and becoming successful in her chosen path. Jasmine believes that a person must have a vision of what he or she wants to achieve, a goal that gives the person a direction in everyday life. With the full support of SUC Dean Dr. Amitabh Upadhya, Head of Quality Assurance Dr. Sudhakar Kota, Head of Academics Dr. Mohammad Hasan Saleh Inairat, Head Student Services Affairs Dr. Osama Ali Thawabeh, and Associate Professor Dr. Riktesh Srivastava along with the SUC community of students, faculty, and staff, the Author Meet and Greet was well received by the audience. The organizing team led by SUC Library Department Head, Mr. Sheik Maideen also organized a book signing after the talk followed by an author interview by students. In her interview, Jasmine managed to share more advices and inspiration to students on how to overcome challenges and finding a motivation after a failure.